Find pressure relief and memory foam therapeutic beds, pillows and mattress protectors, toppers and electric blankets by browsing through this dedicated beds section of ABLEize. Includes sites selling or hiring therapeutic beds including profiling and bariatric beds for assisting bed bound patients either at home or in a residential care environment along with information on pressure relief for all users including the disabled and elderly. ABLEize offers high profile promotion of your website and social media pages, to start promotion your therapeutic beds and mattress products to a wider audience simply click the Submit Your Site button at the top of this page to start enjoying promotion that really works. Discover the Alpine HC range of single and double adjustable therapeutic and orthopaedic beds ideal for in-home and care home use offering maximum comfort for the ideal sitting up or laying down position. Available in a range of fabric colours and prices as well as VAT relief. Trusted UK long-term care market manufacturer and supplier of beds, mattresses, chairs and related comfort and care supplier. 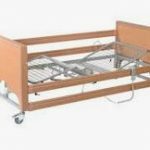 Discover adjustable beds by BaKare Beds a market-leading healthcare organisation that supply children’s and adults electric profiling beds and children’s cots. Their products have been designed in collaboration with therapists, carers, and users of specialist products. Check out their full range online today, chat live via their site or order a no obligation brochure. Offers a wide range of electric adjustable beds, carers beds, mattresses and accessories. The website includes video demonstrations and online ordering with a 7 day money back guarantee. Quality and reliable height adjustable electric easy to use profiling bed available with fast delivery and the buying security of Amazon. Ideal for home and care home use with a large selection of options available. Can be raised or lowered easily to provide patient comfort and carers support. Vat exempt item. Highlighting the Change Mobility selection of bariatric profiling beds designed for greater patient safety and easier handling by care workers either at home or in a residential care situation. Therapeutic bed suppliers of bed management services to the NHS. Includes sales of low hospital beds, bariatric beds, paediatric cots and pressure redistributing mattresses to help prevent issues such as bed sores. Suppliers of bariatric and profiling beds providing patient safety as well as easier for carers and residential care homes to assist the patient while in bed. Site provides inquiry details for private, care home and distributor information as well as size details and costs. Providing details of their therapeutic beds with an explanation of their mattress benefits and highlighting their range of adults beds with details of children’s beds, bunk beds and cots.